Timber floors and suddenly it feels like home. | House by the water. I’m up at 12:30am finishing off a uni assignment (a summer short course) so I hear you about being crazy busy! I thought summer was meant to be relaxing, sheesh. 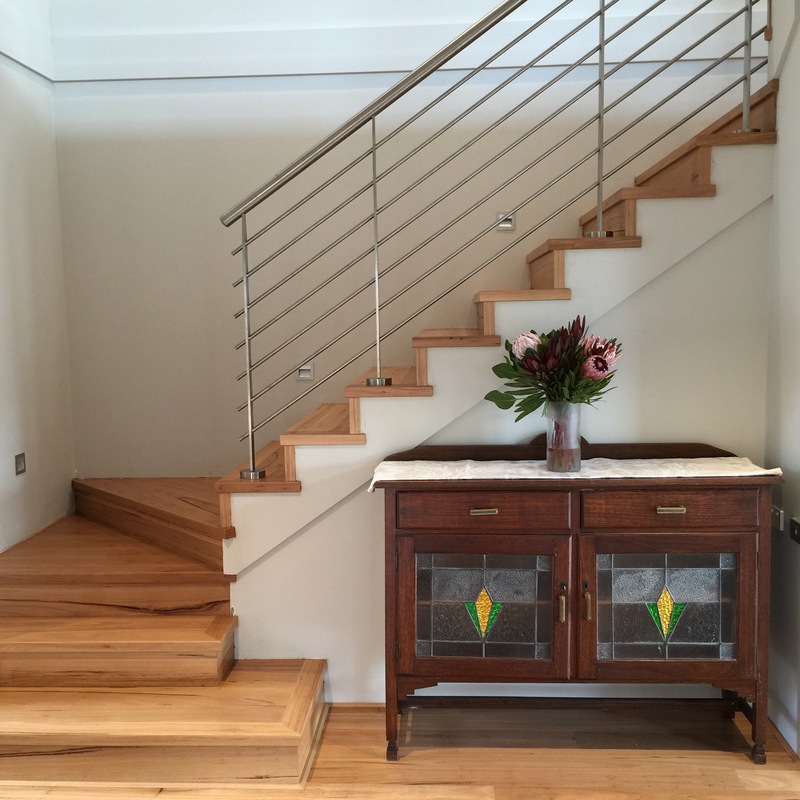 The timber floors look sharp – the stairwell and trimmed steps in particular. Hope you guys are feeling a little more settled in every day. Thanks Steph! It’s starting to feel homely. We are looking forward to Friday and furniture. I’ve been keeping up with your blog but haven’t been able to comment since I’ve been laptopless. 😩. Can’t remember my login. Looking beautiful. 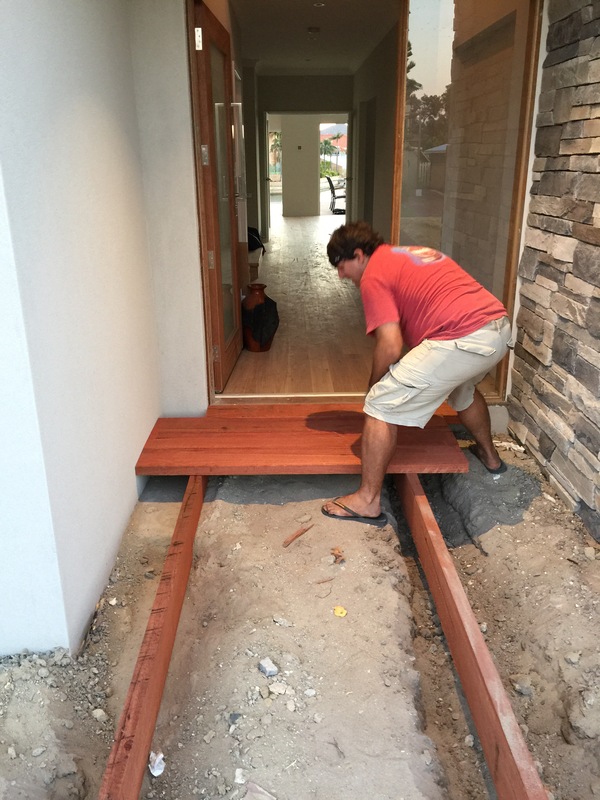 Only on Perth would you find someone building a timber entrance deck in thongs! We move tomorrow after a mad week of carpet and curtains. Wish us luck ! Sarah, that’s very civilised to have carpet and curtains before moving it. Best of luck! I hope you find time to enjoy it. Great choice for the happy corner! I like the timber entrance deck. It is looking lovely Jo. It always seems to be hectic for the first few months and then things slow down and you get to sit back and enjoy. 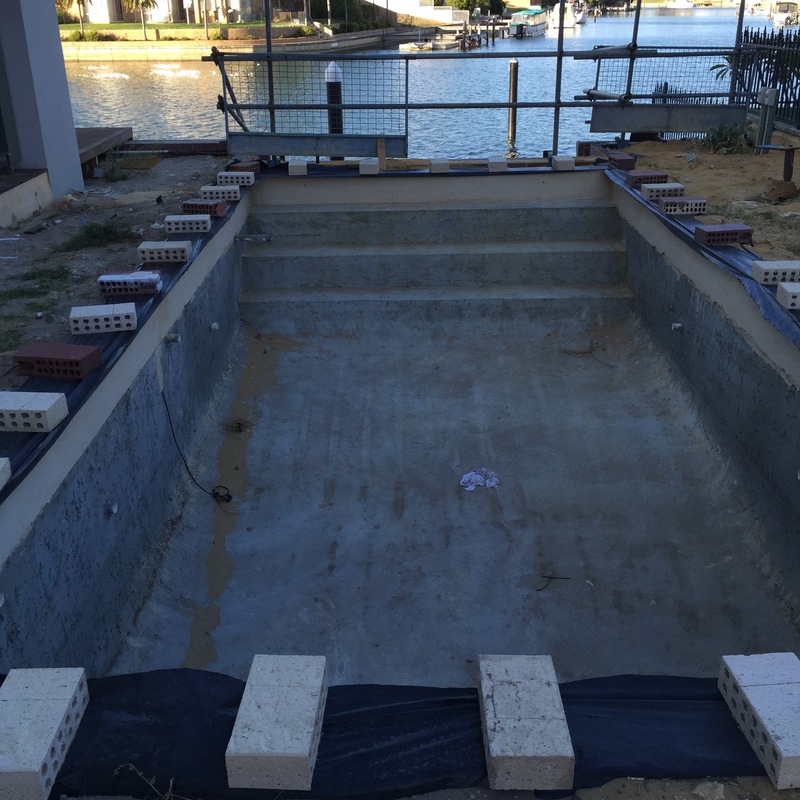 That pool area is going to look amazing!! It’s looking fabulous Jo – you guys have done a more than “superb” job…soon you will be able to sit back and enjoy!!! 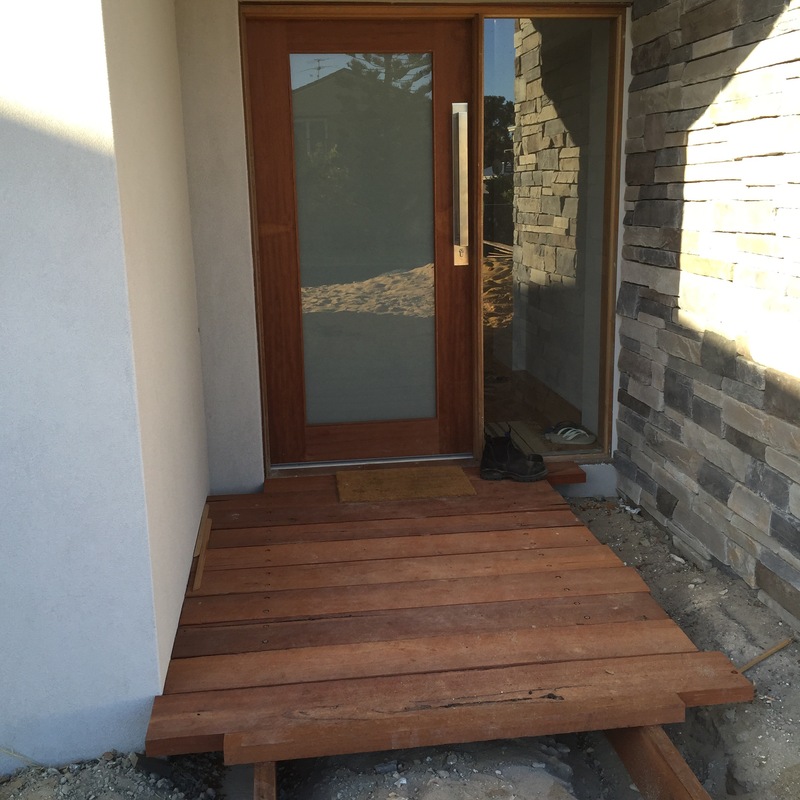 Floors and jetty style entrance are just devine! Looks like you are having fun doing some decorating. Love a jetty style entrance, good work nice wolf! Happy to see you putting your finishing touches in those corners, sounds like fun. We’re stuck with our old furniture for a while yet. Can you please kindly post the VOID area photos!! 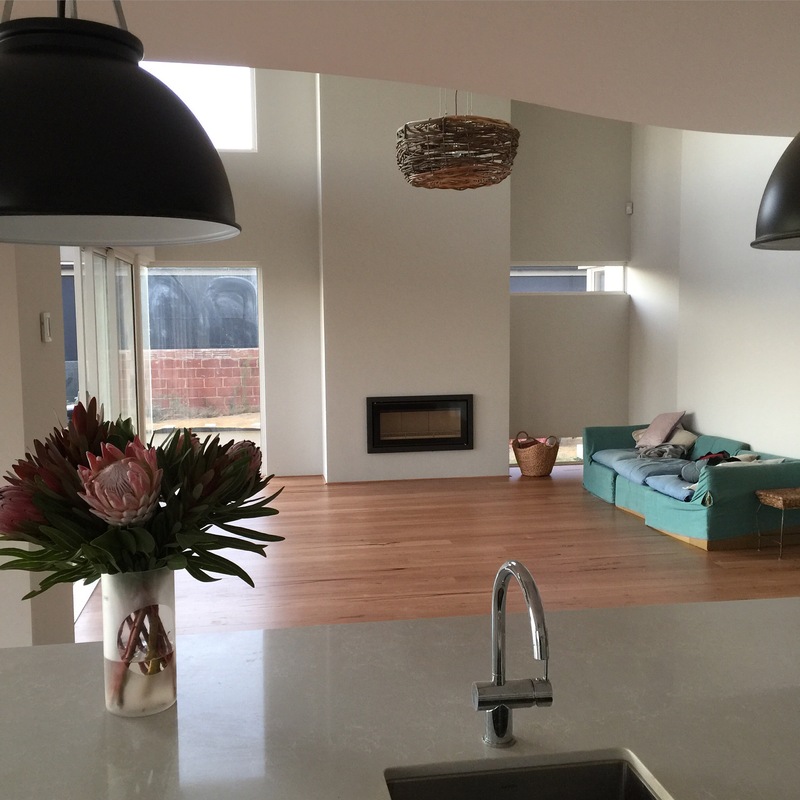 Your timber floors look so beautiful! Congratulations! It looks fantastic – the large glazed area beside the front door caught my eye – really stunning (particularly set against the stone wall)! Looking great! that timber floor i just gorgeous.. 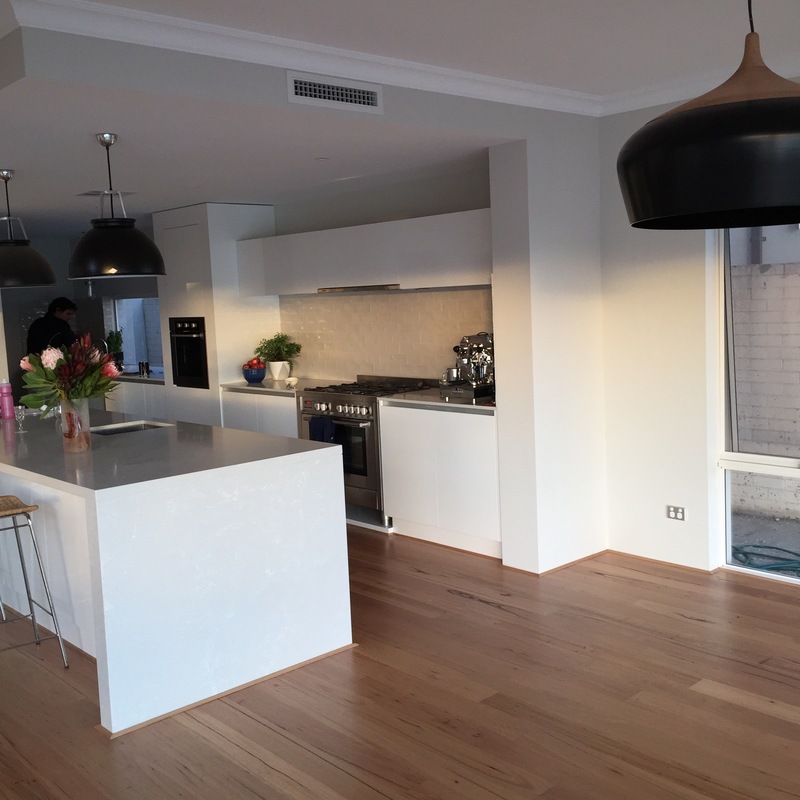 Kitchen looks very nice and timber floor is awesome! I’ve been reading your bog and find it very informative. I’m almost at prestart, building in Perth. Intend putting in solid French oak for the floors. Were you happy with your installer, Auswood? 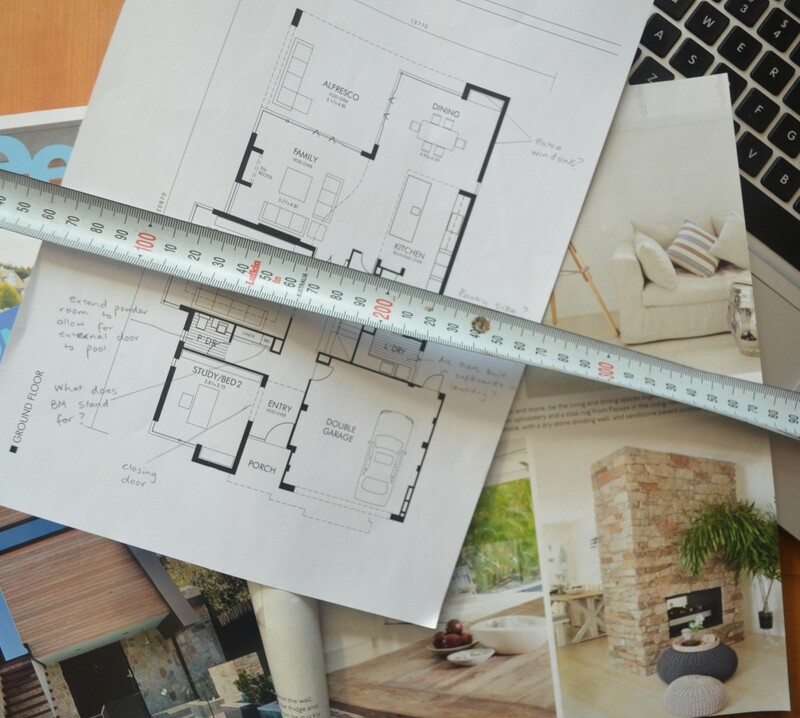 Hi Beng, In the end our flooring job by Auswood seems to be good, however I was not particularly pleased with the length of time that the job took, especially given that we were already residing in our house. They had more than one job on at once, and many days only one member of the team was at work on our job. Also, there was some damage to paintwork, requiring repaint. The floor itself is good. Thanks for reading. One of the installers I contacted suggested leaving the final coat of paint till after installation of the floor but that’s not going to happen as I don’t see the builder agreeing to it. I’ve got Auswood and a couple of others on my shortlist. Your floor looks great. And loved the cobblestone driveway.